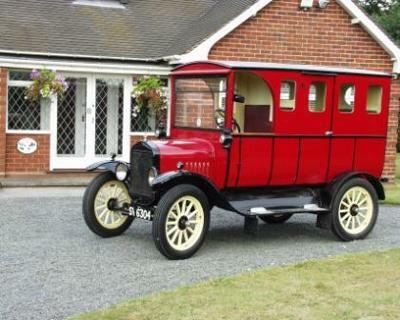 The body of this vehicle started life as a Post-Office van in 1915. In 1927 - due to a chassis failure - a new chassis was commissioned and the older body re-used. On 24.05.27 the chassis was imported into Manchester. This is an ‘English’ Ford ‘T’. The car was totally restored by me present owner approximately seven years ago - it took almost three years to complete both body and chassis work. It was not until restoration was well under way that the above facts were discovered. By then the commitment had already been irrevocably made to create an estate car. The chassis is a standard Ford ‘T’ car chassis. The road wheel rims are demountable - i.e. it is not necessary to take the hubs apart to change a wheel - as is the case with earlier Ford cars. Minor modifications include a stainless exhaust. Additionally discreet indicators & brake lights are fitted.